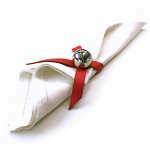 This napkin ring is a 5/8" wide ribbon of soft garment leather looped into a circle and fastened with a plated-steel "jingle" bell 1 1/4" diameter. Slip it around a napkin or over the neck of a beverage bottle as a festive decoration. Click "See more images" for examples.